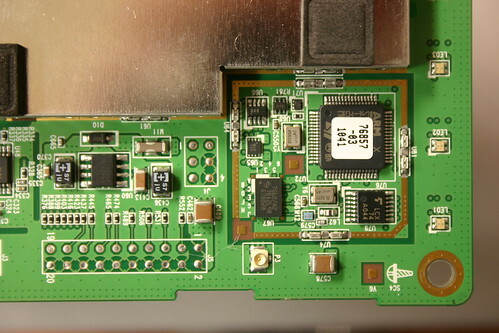 First off, there might be a tamper switch located under the GPS shield. Note the bottom-left corner of the shield connection. There is a small island of metal that isn't connected with the rest of the shield area. Normally this wouldn't be good for shielding, and if you test with a multimeter, the shield does make a good connection to this point. I've added a copper wire to mine just in case. "GloNav Ltd (c) 2007. GN_GPS_Nav_Lib: 2.07.11-080813-000-0000 Aug 13 2008 14:14:31 528"